Kamrup Metropolitan or Guwahati Metropolitan is one of the 35 districts in Assam state in north-eastern India. Kick off your visit on the 31st (Fri): take in the spiritual surroundings of Purva Tirupati Shri Balaji temple and then admire all the interesting features of Indira Gandhi Athletic Stadium. For maps, other places to visit, more things to do, and more tourist information, read Kamrup Metropolitan District trip maker site . Pune to Kamrup Metropolitan District is an approximately 6-hour combination of flight and taxi. You can also drive; or do a combination of bus, train, and taxi. May in Kamrup Metropolitan District sees daily highs of 38°C and lows of 26°C at night. Finish up your sightseeing early on the 1st (Sat) so you can travel to Tawang. On the 2nd (Sun), appreciate the history behind Tawang War Memorial, then trek along Bum La Pass, and then take in the architecture and atmosphere at Taktsang Gompa. Keep things going the next day: take in the dramatic scenery at Nuranang Falls, explore the activities along Sela Pass, and then take in the spiritual surroundings of Tawang Buddhist Monastery. 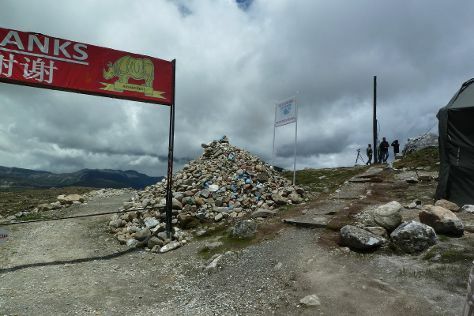 To see other places to visit, more things to do, maps, and more tourist information, read Tawang trip itinerary planner . You can drive from Kamrup Metropolitan District to Tawang in 14 hours. Wrap up your sightseeing on the 3rd (Mon) to allow time to travel to Cherrapunjee. Visiting Mawsmai Cave and Mawkdok Dympep Valley will get you outdoors. Take a break from Cherrapunjee with a short trip to Elephant Falls in Shillong, about 1h 15 min away. To see more things to do, maps, photos, and more tourist information, read our Cherrapunjee travel route planner. You can drive from Tawang to Cherrapunjee in 17 hours. Wrap up your sightseeing on the 6th (Thu) to allow time to travel back home.